Revenue is trending upward for small businesses across the nation. Use these stats and insights to help you climb on board the upswing and increase small business sales in 2018—and beyond. 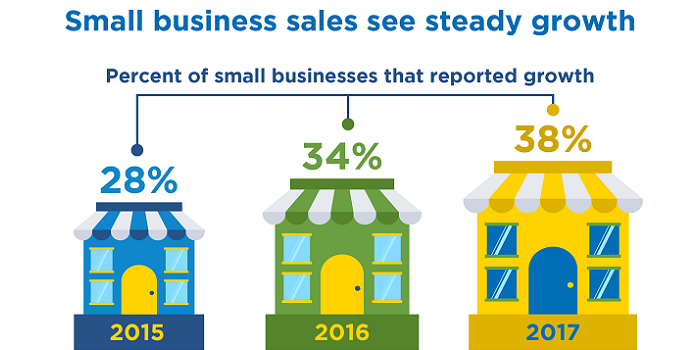 Our infographic, “Small Business Sales Are Up,” showcases the bright spots—and identifies the stumbling blocks that continue to challenge owners. Steady is the word for small business growth during 2017. In a Statista survey of small business owners, 38% reported higher revenue. That represents a positive trend that saw 28% of owners reporting growth in 2015 and 34% in 2016. The highest small business growth areas in 2017 include professional scientific and technology services (9.1%), healthcare (8.4%), manufacturing (5.3%), accommodation and food services (4.7%), and retail (2.7%). Yet owners continue to face challenges. About 60% of small businesses say attracting new customers is among their top issues. Owners also cited key challenges like growing revenue (55%) and improving cash flow (35%). Word-of-mouth power continues to impact small business success. Results from an Alignable poll suggest 85% of owners believe this oldie-but-goodie is their top source for acquiring new customers and sales. But word-of-mouth is about more than a homeowner asking which landscaping company installed the neighbor’s new flowerbeds. It can also include a powerful online component that may help you increase small business sales. The vast majority of consumers (88%) say they trust online reviews as much as personal recommendations. If you’re one of the small businesses struggling to attract new customers, it’s worth considering creating a strategy to ask for client reviews on relevant sites, whether it’s Facebook, Angie’s List or Yelp. There’s another statistic that further underlines the importance of earning positive ratings online: consumers spend up to 31% more on products and services from businesses backed by excellent reviews. So, in addition to helping attract new customers, a portfolio of great online reviews can help you boost sales. About 51% of U.S. consumers prefer online and mobile shopping. Yet 74% of small businesses don’t have an ecommerce-enabled website, according to Small Business Trends. While ecommerce isn’t suitable for every business, those with products or services suitable for online selling should consider getting on board. ECommerce will do more than connect you with the majority of consumers who would rather do their shopping online—it also gives you an edge over competitive businesses that don’t offer online purchasing. If you sell relevant products or services and don’t yet offer online purchases, going eCommerce is easier than you think. Lack of a website may have hampered some businesses considering consumers’ growing preference for all things online. 29% of small business owners say they don’t have a company website. However, that gap may be closing as owners recognize changing consumer needs. About 92% of small businesses without sites say they plan to launch one by the end of 2018. If you don’t have a website yet, our recorded webinar “Essential Elements of Every Small Business Website” is a good starting point. If you stumble over attracting new customers, growing revenue or other small business snags, you’re not alone. Talk with a SCORE mentor today. Their experiences can guide you, so you can increase small business sales and build a healthier business.